I hope you all had a great weekend. Mine was less productive than usual. Although there were so many things which I had to take care of, I ended up sitting in front of the computer in a mixture state of upset and angry. There are so many things going inside my head right now, if I would try to put them into words, probably I would fail. So I decided to wait for a better moment. As blog was the main reason to all the frustration, I was not very inspired to write a post. Today I will try my best to be as cheerful as possible. An exciting launch which I was waiting for just happened a few weeks ago. 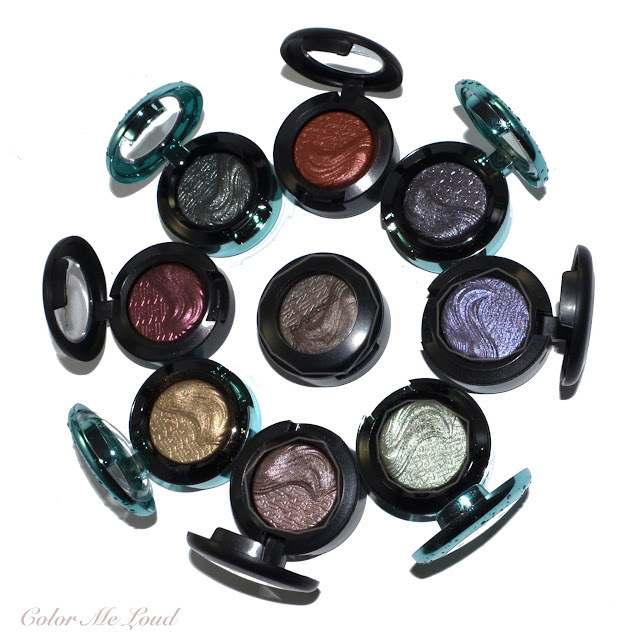 MAC's Extra Dimension Eyeshadows, which were always released as limited edition are now permanent. I love the formula and couldn't resist getting one or two shades each time they were released. Extra Dimensions are nicely pigmented eye shadows which can be applied wet or dry. They have a metallic finish but I find them less frosty than Nars Double Intensity or Burberry Wet & Dry Glow eye shadows. The shimmer is very complex and beautiful. There were six Extra Dimension Eyeshadows in last year's Alluring Aquatics Collection and I ended up with all of them. Four of these are now repromoted to stay. There were two more shades I got from Magnetic Nudes Collection. I now purchased three of the shades I missed previously so here are my swatches and thoughts about nine of the eighteen shade release. First of all I would like to mention that these do swatch more shimmery than they apply on the eyes so don't be afraid by the sparkly swatches. On my eyes they don't look overly shimmery but rather complex and more dimensional. I find the name extra dimension very self-descriptive. I also like the fact that, the design and tiny MAC print on the powder doesn't wear off easily. Mine are used at least few times each but they still look pristine. Some of mine are inside the wet looking turquoise packaging which was limited. I noticed that the black packaging doesn't have an additional protective plastic between the powder and the cap. I think it is better that way. I don't see the point why you need one and extra plastic is always bad for environment. I divided the shades into two groups so you can see the similar shades next to each other. Sea Worship is a beautiful mid-toned antique gold with a touch of khaki. The finish is shimmery/metallic but on the eyes not overly so. Silver Sun is a mid-toned grey green with silver shimmer. This is the most difficult shade for me to pull off because of its coolness and greenness at the same time, it amplifies my under eye darkness. I needed to get the last one of the bunch of Alluring Aquatics, this is why I ended up with it. I believe it works better for cooler undertones. Nevertheless a beautiful complex shade. Legendary Lure is a very deep anthracite with a green tingle under some lighting. It is great for a smouldering eye look, I especially love it for summer evenings, looks like the stars reflect over your eyes *wink*. Recommended for those who like it deep and smoky. Silver Dawn is a chameleon which I purchased when it came out with Magnetic Nudes Collection together with Amorous Alloy. It is a beautiful neutral taupe. Under some lights it looks a bit mauvy. It is a great everyday swipe and go shade which has comparably less shimmer than most of the others in the line. I see Silver Dawn working across the skin tones since it is not too cool nor too warm. It is one of my favorites. Amorous Alloy is a mid-toned reddish copper with golden shimmer. It is a very warm shade. I must have purchased it to make green/yellow eyes pop but since it is really warm, the rest of the make up has to be chosen carefully. Rich Core is a beautiful neutral to warm purple. Caution #Teampurple you need it. On the eyes it applies deeper and less shimmery. I have an eye look below for you. Since it is deeper, it is really smokey, so get your mood on. Stolen Moment was a shade I missed previously. After I swatched the re-released shades, I knew I needed it so bad in my life. It is a beautiful mid-toned taupe with touch of right dose of mauve. It is cooler than Silver Dawn. Stolen Moment is perfect from the name to the finish and how effortlessly chic it looks on the eyes. A must-have taupe for taupe fans, you need it! Fathom's Deep is one of the smoky till I die shades from Alluring Aquatics. It was sold out everywhere upon its release last year. A deep purple which everyone felt the need of. I love it, but be warned, it is not for the faint-hearted. It is deep and more shimmery than the other shades so you rather be ready for some drama there. Grand Galaxy is another shade I picked up recently. It is like stars twinkling on a super pretty cool purple base. I love that but it is a bit sheerer than the other shades in the range. For best results I'd rather apply it over a cream base. Now ready for a few eye looks? Here is Stolen Moment on the eyes combined with a whitish highlight on the inner corner. This is a super quick make-up when I was rushing super late. Stolen Moment is for those days. I blended over the crease here with MAC Omega. 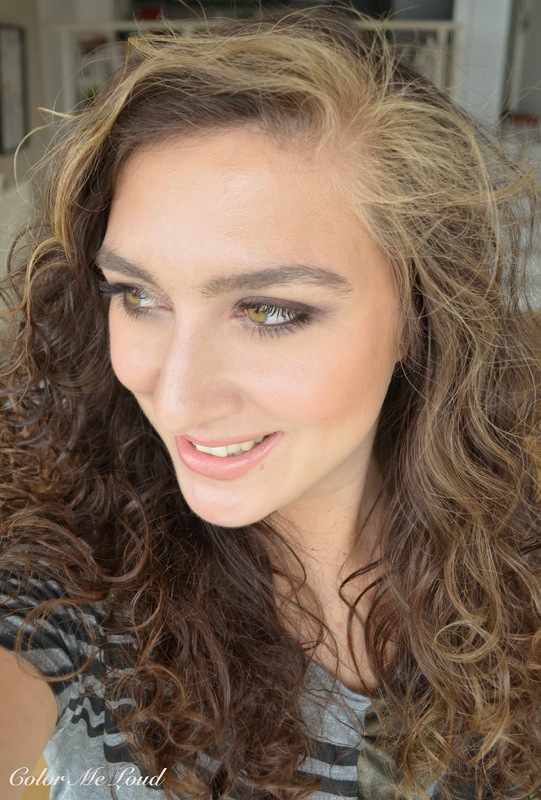 Here is the super quick FOTD. You can see the list of all the products used at this Instagram post. 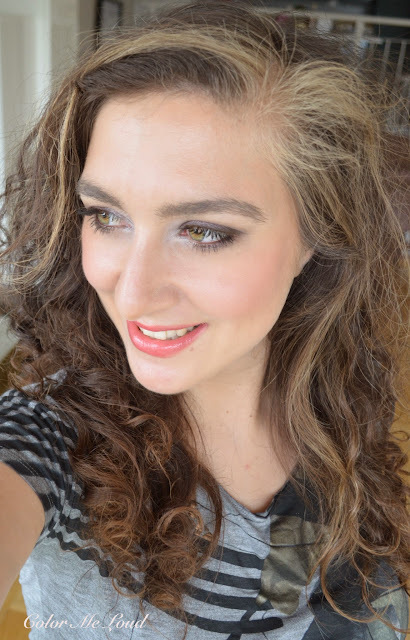 On my cheek I have Frantic Pink and on my lips RMK Irresistible Glow Cherry Red (reviewed here). After seeing Rich Core applied deeper on the eyes, I popped some peach on the inner corner from one of my MAC palettes. I am not sure which shade it is though but if you are super interested I may try to find out ;-) See this one is less shimmery and more smoky than it appears on the swatch. I really like it. Here is the full look. I am wearing Tom Ford Spanish Pink on the lips which I love wearing with all sorts of smoky eyes, be it blue, purple, gunmetal or green. Also check out another eye make-up from last year with Sea Worship and Fathom's Deep here. Final thoughts: All in all yay for one of my all time favorite eye-shadow formula now being permanent. I hope they do it for the Extra Dimension Skin Finishes and Blushes too. I sort of wished Lorelei would return too. I am eyeing the interesting pink one called Stylishly Merry. Also Smoky Mauve is calling my name. Availability/Price: MAC Extra Dimension Eyeshadows are now available at MAC Counters and at online stores. They are around $20/24€ each. Have you tried MAC Extra Dimension Eyeshadows? Do you like the formula? Disclaimer: All products in this post were purchased by me. I always use a primer underneath. I am so used to it, I can't do without a primer. It enhances the finish and the shade too. These shadows are seriously stunning, though I seldom to never buy Mac. Gorgeous! Hey Sara, ahh what a pretty collection! I like Sea Worship the most, so I'm glad it is now permanent! I have chosen Silver Dawn and Stolen Moment, I mean for my wishlist until douglas will come up with a sale or I will travel to the US or happen to be in the duty free in London (Swiss prices are a bit insane). They are not super unique shades, but this is a lovely formula and I am glad that Mac has also realized that. Oh same here by a long shot! 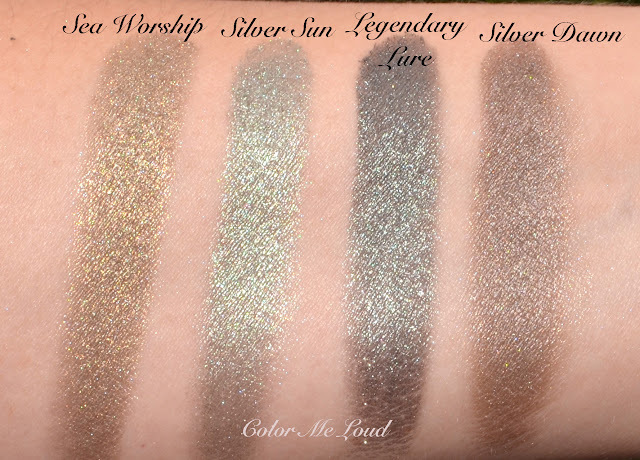 I was eyeing silver sun but stolen moment looks fab too! Glad these are permanent now, hehe!! I LOVE this formula and I was super happy that MAC released a permanent line of Extra Dimension shadows. Like you, I bought all six from the Alluring Aquatics collection. I haven't picked up any others yet, but I definitely will (summer collections have been killing my wallet the last few months and I'm a sucker for LE items :-D). Oh you just reminded me how much I loved the Alluring Aquatics! They must be hiding somewhere deep in the recesses of my wardrobe, I need to dig them out soon! Legendary Lure never made it here, even though it was the one I wanted the most back then... maybe I should go check it out if it's here now! Wow, I don't think there is a shade in there that I don't like. I especially like legendary lure. I'll keep and eye out for these in Mac. I love green based shades. 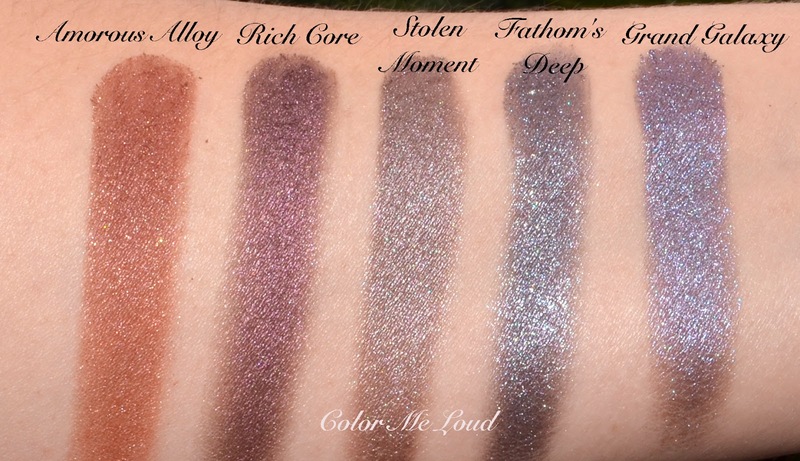 I have only one of these shades, back from the Alluring Aquatic collection and I like it a lot (I have Silver Sun).Fathom's Deep looks the most beautiful to me and I am glad these are permanent right now and I will def pick it up at some point! I love the formula and how elegant they are! I know you got it right? Can't wait for your review! I remember last year we talked about Sea Warship, you wanted to get but it was sold out or something. I was watching the news, I sincerely hope everything turns out the best for Greece. Beautiful choices, these are my favorites too! Yes I am all for the permanent. I don't want to be stressed out and buy things I don't want. And this formula is great so thumbs up for the decision. I know, you can't stop with just one. The same here, I was like let me buy one and ended up with three. Then now I want two more. Someone stop me! yes I am trying not to go overboard with these. I have two/three more in my wish list, I am waiting for the next month to pick them up. It is great to be able to plan and not be under pressure to get something. I am all in for the permanent products, yay! yes take out these lovelies, put them on and show us your fab FOTDs. Hahaa Same here! I 'm planning to buy the whole range !! Things in Greece are in crucial point! There is so much insecurity for the next day. And the media do not help the situation. They spread the panic to the people :( My heart and my soul are with our families. Spmetimes i feel a kind of guilt because i spend money for what i really like and then i realise it's a way to think more positive and makes me forget the real problems. Thank you very much for thinking of us! It really gives me hope! I have the attention span of a bird.... so i'll let this pass and wait for something new. I've already got my eyes on a few FW / Holiday 2015 collections!! LOL, hope you like them!